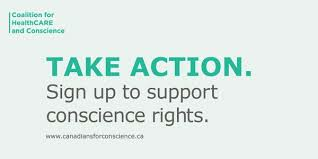 Euthanasia Prevention Coalition Euthanasia Prevention Coalition: Ontario Court decides to force doctors to refer patients to death. Ontario Court decides to force doctors to refer patients to death. Sean Fine, Globe and Mail Justice writer reported that Ontario's Divisional Court (3 - 0) decided that doctors in Ontario, who oppose killing their patients, must provide an effective referral to a physician who will kill their patient. "The evidence in the record establishes a real risk of a deprivation of equitable access to health care, particularly on the part of the more vulnerable members of our society, in the absence of the effective referral requirements,"
the divisional court said that though the policy does limit doctors’ religious freedom, the breach is justified. Sign up to support the Coalition for Healthcare and Conscience (Link). 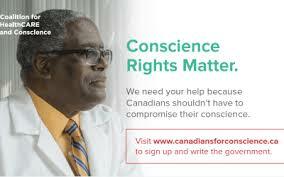 "Our position is doctors who opposed assisted suicide or physician-assisted death are put in a position now where they either need to violate their conscience and their religious and moral belief or face being disciplined by the college – and that's not a good place to be,"
...most provinces do not require referrals to willing physicians. Alberta, for example, co-ordinates requests and referrals through a centre that patients can call on their own. The faith groups do not object to referring patients to the centre. Manitoba has a team of physicians willing to help the severely ill end their lives. Ontario has now set up a co-ordinating centre but faith doctors say they are still concerned that they are responsible for an "effective referral." Fine reported that this case is the first to test the constitutional rights of doctors who object to assisted death on grounds of conscience. and the decision comes as doctors opposing assisted suicide struggle to find a middle ground. Some hospitals run by Catholic, Jewish or other religious groups have declined to offer assisted dying. In those cases, patients are transferred to other facilities. Recently a Jewish care home in British Columbia accused a euthanasia doctor of sneaking-in and killing a resident. Fine reported that, as of December 31, Ontario's chief coroner has recorded 1,030 deaths by physician-assisted death in Ontario. The Supreme Court of Canada struck down the previous law on assisted dying in February 2015. The court said nothing in its ruling compelled physicians to provide assistance in dying. It added that it was up to governments and regulatory colleges to reconcile the Charter rights of patients and physicians. Parliament legalized assisted death on June 17, 2016. The legislation stated in its preamble that doctors have a right to freedom of conscience, and are not required to perform or assist in the provision of an assisted death. The decision by Ontario's Divisional Court will need to be appealed. Dr Ramona Coelho: We are a nation of Laws and Conscience. Alex Schadenberg: Ontario doctors will leave the Province if they are forced to participate in assisted dying. Alex Schadenberg: Health professionals opposing euthanasia require conscience protection. Alex Schadenberg: Ontario doctors shouldn't be forced to refer their patients for euthanasia. Thou Shall Not Kill People ! We truely live in a culture of DEATH. I constantly remind my kids that those little freedoms we allow the government and evil people behind them will eventually evolve into tyranny. I am not at all surprised (but still outraged) that any government takes actions to legitimize the killing of it's own citizens. Abortion and euthansia are only the beginning. Starting with seemingly merciful killing leads to removing choice of medical establishment (forcing referrals) and will LEAD TO REMOVING CHOICE FROM PATIENTS, FAMILY, EVERYONE. Freedom and liberty is gone in Canada. Why should soldiers,airmen, and sailors offer their their life for a culture of DEATH. Trust in physicians will be eroded if they are forced into euthanasia, the killing of patients. This is not a country of law . This is a democratic totalitarian rule, similar to Nazi or Communist atrocity of the past where no GOD IS . This must be returned to the true dignity of life with optimum palliative care in comfort and compassion.Pray and fight for the culture of life . When the wicked rule, the innocent suffer.